Dressing in professional, form-fitting attire fuels your confidence and affects your career path. But sweat marks and stains diminish your confidence and burn a huge hole through your pocket. In this blog post we’ll talk about the high cost of armpit sweat. We’ll also show you seven ways to protect your shirts from sweat. Looking polished and oozing confidence at work can catapult your career. In fact, your appearance affects how others perceive your financial success, authority, trustworthiness, intelligence and hiring or promoting potential. With the average person sweating 270 gallons each year, sweat stains on dress shirts is a daily struggle for many. And cycling through expensive button-downs costs more than you might realize. Say you invest a couple hundred dollars in a few nice dress shirts. Between your armpit sweat, aluminum-laden antiperspirant and excessive washing or dry-cleaning, you cut the lifespan of these shirts down to a few months or weeks. And over a year, you can rack up a hefty bill. Instead of spending aimlessly on costly dress shirts and work attire, it’s time to start thinking of your wardrobe as an investment and taking the right steps to protect it. Wearing dirty clothes can make you self-conscious. But washing or dry cleaning your dress shirts after every wear also diminishes their lifespan. So what's the solution? Washing breaks down the fibers in your clothing, which can make your dress shirts appear older, faster. Try skipping a wash to get more life out of your dress shirts. Carrying a Tide To Go pen and lint roller in your car or bag are also smart preventative measures. Another way to launder less is by hanging your button-down shirt immediately after taking it off or draping it over a dresser or other surface so it doesn’t end up dirty on the floor or wrinkled. Sick of throwing out your yellow-stained dress shirts after just a few wears? If you’re a clothes-washing fanatic, sweat heavily or just want to preserve your dress shirts, wear a Thompson Tee beneath your outer layer. The sweat proof barrier completely absorbs and blocks sweat. 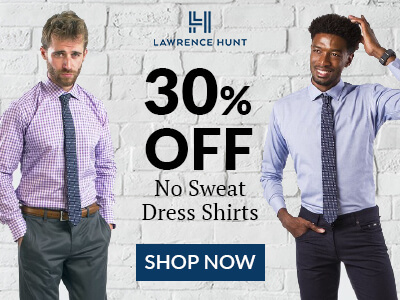 As you move around, your underarm sweat evaporates — preventing embarrassing and costly sweat marks from reaching your favorite dress shirts and suits. Did you know antiperspirant is the culprit behind yellow stains? It's true. When mixed with sweat, the aluminum in antiperspirant leaves a yellow tint that doesn't come off easily. Avoid using antiperspirants if possible — and instead opt for a natural deodorant — to prevent yellow sweat stains from wearing down your shirts. Separating your clothes by whites and colors is a smart laundry tip. But who really takes the time to do it? If you want to get more wears out of your wardrobe, consider taking the a few minutes to separate whites and like colors into different piles. Keeping dissimilar colors apart in the laundry can help preserve the coloring of your clothing. Cold water should be your go-to laundry setting. Minimizing the heat impact on your dress shirts helps them hold up better and longer. That’s because heat breaks down dyes in clothes and causes shrinkage. Colors last longer and clothes retain their size and shape when using cold water. The dangers of heat also apply to drying your clothes. Dryers wear out your clothes and fade colors faster than sunlight. Line-drying or hang-drying your shirts can minimize shrinkage and help maintain their shape longer. Invest in a clothes rack rather than a heated dryer, and you will also save hundreds on electricity while doing right by the environment. Use cedar wood hangers. Cedar acts as a natural repellent to moths and won’t damage or stretch out clothing like wire hangers. The wood also absorbs moisture, preventing mildew from forming. Immediately remove plastic bags from dry-cleaned items. If left on too long, plastic bags can cause yellowing or mildew. Fabric needs to breathe, and encasing your freshly dry-cleaned button-down shirts in a plastic bag suffocates them while trapping odors and humidity. Although plastic might appear to “protect” your clothing, it does more harm than good. Fold and hang the right way. Surprisingly, hanging all of your clothes isn’t the best way to preserve them. When hanging heavy or even light sweaters, the pull of gravity stretches them out. But folding your dress shirts also causes wrinkling and awkward creases. Fold your sweaters and hang your dress shirts to keep their shape intact. We hope these tips save you money on dress shirts this year! What other ways do you prevent sweating through shirts and preserve your wardrobe?